Volkswagen Golf / Rabbit / GTI Fuel Economy Pros and Cons | Page 1 of 3 | Why Not This Car? EPA ratings for the two cars are nearly identical. When fitted with manual transmissions, the Mini is rated 25/34, the Volkswagen 25/35. With automatics, each does the same in the city and one mpg lower on the highway. I'm averaging in the mid to upper 40 mpg (around 4.9 l/100 km) range combined, with about 70% of my driving on the highway. Quite satisfied. I get 22 MPG in mostly city use, over 32 MPG on the highway. Accptable considering I tend to drive with enthusiasm. I average 43mpg in a little over half highway driving. I get 55mpg on the highway and about 35mpg in city driving. This is very impressive considering this car's performance. The Golf TDI easily beats the Honda in fuel economy, while giving up little in performance. We just took at trip in the TDI and averaged 48.8mpg. The Honda V6 is very efficient, but can't compare. Averaging 40 mpg over the first 200 miles. Online reports indicate this will go up as engine accumulates miles and breaks in. I have only had this car for one day, but I put 150 miles on it yesterday and averaged 40 mpg in mixed city/hwy driving. Excellent return with a higher than normal gas economy. This factor made the other deficiencies easy to overlook. So far averaging 25mpg with spirited mix of city (65%) and hwy (35%) driving. Great fuel economy even for a fast turbo charged car. The car is quite powerful, but heavy. Gas mileage is more in line with larger performance sedans than other compact hatchbacks. I get 30 easily driving it 50/50 city and highway, and not being particularly hard on it (but not beating it either). 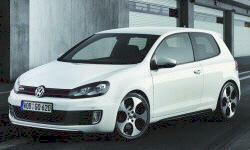 Among similar "hot hatch" models, the GTI gets the best fuel economy by 5-10 mpg.